Presented by The Travelers Insurance Company at the 1964-1965 World's Fair. 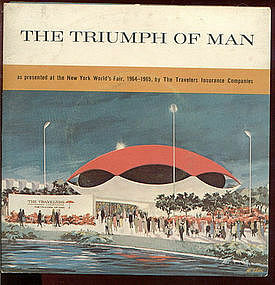 "The Triumph of Man" contains a 33 1/3rpm red record, and a fold-out denoting what Travelers believed to be the thirteen most significant events in man's history. From "The Dawn of Man" to "Man's Leap to the Stars"